It was mid-July in 1806 when Alexander Henry Jr. arrived on horseback at Assiniboine House, a North-West Company trading post situated on the north bank of the Assiniboine River two miles upstream from the mouth of the Souris River (NE ¼, Sec. 19, Tp. 8, Rge. 16W) while on a south-southwest course to visit the Mandan Indians on the Missouri. Judging by his comment on the starving condition of the occupants of this fort and nearby Brandon House, a Hudson's Bay Company fort - "no trade, no furs, no buffalo" - he could not have known that less than three quarters of a century later a vast portion of the area would suddenly be trans-formed into a fertile plain of large cultivated acreages and lush pastures. True to form, a settlement sprang up in the centre of this agricultural paradise (about 17 crow miles northwest of the cluster of forts), and the phenomenal growth and development of this pioneer city (and the district that sustained it) over a period of six years is the substance of this story. It all started in 1879 and 1880 before the Canadian Pacific Railway had commenced the construction of its line westward from Portage la Prairie. Parties of immigrants from the eastern provinces and England who had all come into Manitoba by the American railway lines and westward from Emerson through Pembina Mountain country by way of the old Missouri and Boundary Commission Trails, roamed about the district in search of suitable tracts of land to settle upon. One of the most well known of these were the Elliotts who pitched their tents in the fertile plain of the Souris in Township 7, Ranges 17 and 18, southeast of what is now the city of Brandon. "These hardy pioneers underwent great hardships in reaching a tract of country suitable for settlement," wrote the editor of the Winnipeg Sun in the Mid-Summer Holiday Number of 1888, "but the picturesque and wonderfully fertile character of the locality they chose, shows what they knew about farming before they immigrated west." One particular group of immigrants who were under the guidance of a Rev. Mr. Roddick endured great hardships as they came westward from Winnipeg by the trader's cart trail across the Big Plains to the crossing of the Assiniboine (on Sec. 21, Tp. 10, Rge. 18 according to an old township diagram). They had come all the way from Nova Scotia - "away down by the sea." But the countryside around the crossing did not appear rugged enough so they pushed away to the distant "blue hills of Brandon" where they took up homesteads. Among these was a sea captain, a Mr. Johnson by name who had apparently turned from his profession to agriculture - an unusual event indeed. Just how enterprising these pioneers were who had settled on the 100 odd townships adjacent to the crossing is indicated by a stirring report in the Winnipeg Evening Sun, Midsummer edition, 1888. In about six years a total of 83,000 acres was already under cultivation in spite of the comparatively primitive methods of sod-breaking used in those days. It was mostly done by horse-drawn walking or sulky plow one furrow at a time. Of this acreage, in 1887, 60,000 was seeded to wheat, 17,000 to oats, 2,200 to barley, 2000 to potatoes, turnips and fields roots and 50 acres to peas. A trifling amount of flax was sown. Although horse-drawn mechanical seeders were used to quite an extent, a large portion of this fantastic acreage of cereal crops was broadcast sown - by hand. The yield from the wheat acreage - which was increased by 13,000 over the previous year - was equally fantastic. At 32 bushels per acre (the average wheat yield for all of Manitoba that year) the 60,000 acres produced a staggering 1,920,000 bushels which was 15% of the total of 14,000,000 bushels produced in all of Manitoba that year. The Winnipeg Sun adds: "Nearly 75 percent of the entire area was sown upon summer-fallow on late fall plowing which, with the favorable season, accounts for the large yield and excellent sample of grain over previous seasons. The varieties sown were chiefly red and white Fyfe, the red predominating. Sowing commenced generally in April and was finished early in May. The first cutting of wheat commenced about August 10." The Winnipeg Sun cited particular areas west of Brandon that made a considerable contribution to the enormous wheat harvest. Alexander and Kemnay combined shipped 300,000 bushels; Griswold, 400,000 bushels. This is noteworthy, considering the fact that as recently as 1881 this tract of country was one vast wilderness. The "who's who" column for top producers from that area (from 5000 to 10,000 bushels) for that year included Messrs. G. G. Hilliard, J. Spears, G. Armstrong, F. Bannatyne, C. E. Hall and Thomas Touchbourne. East of Brandon, the centres of Chater and Douglas shipped 300,000 bushels of wheat. Other yields were: oats 714,000 bushels; barley, 66,000 bushels; potatoes, turnips and field roots, 410,000 bushels; peas, 750 bushels. About 2000 tons of hay was harvested. Large operations were not uncommon even in the pioneering decade of this district. One of these was the McBurnie farm comprising nearly 9000 acres in Township 9, Range 20 and Township 10, Range 18, in an area known as Roseland. The Winnipeg Sun records: "This enterprising gentleman, who resides in Jersey in the Channel Islands has erected capacious buildings, fencing, schoolhouse, church, blacksmith shop and other valuable improvements and rents these farms on shares or yearly cash rental. About twenty families occupy these lands upon which have been expended nearly $200,000." Interest in stock raising was slowly but steadily increasing owing to the abundance of hay, ideal pasturage and numerous streams and lakes that dotted the landscape but king wheat held the spotlight as the number one objective for quite a number of years. The actual breakdown in bushels in yearly yield increases is as follows: 1882, 250,000; 1883, 450,000; 1884, 560,000; 1885, 900,000; 1886, 550,000. (1886 was a bad year). The prosperous appearance of the district "with good buildings and fencing, bridges and improved trails, schoolhouses, churches and other conveniences" was indeed tangible evidence of the industry and vision these pioneers possessed. Nestled prettily in the broad Assiniboine valley near the crossing of the river and in the centre of this teeming agricultural area lay the burgeoning settlement that sprang up in 1881. "A more beautiful site could scarcely have been chosen" commented the editor of the Winnipeg Sun. But the actual circumstances that led General Rosser of the C.P.R. - in charge of choosing new townsites - to make a final decision on a suitable site for a major divisional point are perhaps more remarkable than the choice itself. It was in the spring of 1881 that Rosser first approached Dougald McVicar, the co-founder (with brother John) of Grand Valley, a settlement on the north side of the Assiniboine River about two miles east of the present city of Brandon and offered him $25,000 for it. (Grand Valley boasted eight general stores, two hardware stores, one drugstore, two liveries, two boarding houses, one hotel, a doctor, a jeweller, a baker, a carpenter, a surveyor, a harness maker, a population of 800, a real estate value of $100,000 and a huge measure of confidence that it would be the C.P.R. 's choice). Dougald consulted his neighbor for advice and was told that if the C.P.R. really wanted the site, they would be willing to pay $50,000 for it. When Dougald made the proposition to Rosser the latter declared, "I'll be darned if a town of any kind is ever built here." He commanded his teamster to hitch up the horses and to Dougald's chagrin, drove off in the direction of the river. They ferried across and drove two miles west to the elevated land where Brandon now stands. He found a shanty on this site occupied by L. D. Adamson and offered him $25,000 for the quarter section he had staked out for his homestead in February of 1881. Adamson accepted and the site, which already hosted some 150 residents living mostly in tents, was christened "Brandon" after the Brandon Hills eight miles to the south. These hills had been, in turn. named after a Hudson's Bay Company fur trading post on the Assiniboine in 1794 two miles upstream from the mouth of the Souris. It had been called "Brandon House" after the head of the House of Douglas, a large shareholder in the H.B.C., who had been created the Duke of Brandon in 1792. The editor of the Winnipeg Sun reported that "there are few places that possess natural attractions and advantages possessed by Brandon. Favored with such conditions by starting, neither time nor opportunity has apparently been neglected in developing the city as rapidly as possible. The phenomenal growth of Brandon testifies to the intelligence, push and energy of her citizens. Less than six years ago there was nothing to distinguish this prosperous and growing city from the rest of the then trackless prairie. Now the beautiful streets, solid buildings, elevators, manufactories, etc. afford evidence of what might signify years of growth and development." 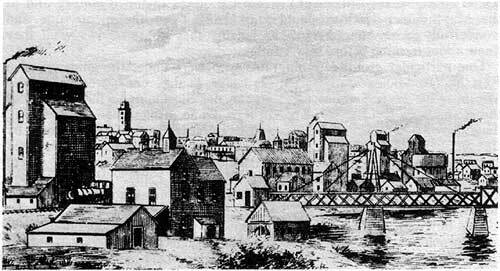 The city at that time boasted a population of 4000. Of course, with wheat representing the touchstone of commerce a commanding feature of Brandon's expanding skyline were the buildings that housed the city's grain storage and milling facilities. There were five elevators which included the Ogilvies, Mitchell and Campbell, McMillans, McLaren, Parrish and Lindsay; one grain storage warehouse owned by Thomson and one steam operated flow and oatmeal mill and elevator owned by Kelly and Alexander. The total combined storage space was 200,000 bushels. Over 10,000 bushels a day was handled by these facilities. Brandon handled twice as much wheat as the next largest point in the whole Northwest Territories. In fact, in 1888, Brandon claimed to be the largest primary grain market in the world. The goal for the immediate future was to have 5,000,000 bushels of wheat "raised and for sale" within a radius of ten miles of the city! The pulse of the grain trade and related commerce was the newly laid C.P.R. transcontinental line which passed through the heart of the farming areas. The company's projected line to the Souris Coal fields in the south-west caused no small stir of optimism among the citizens of Brandon and district. It was estimated that coal could be "laid down" in the city for $4.00 a ton. According to the Brandon Sun, Northern Pacific was secretly planning to build a line to the south-southwest of Brandon through the Turtle Mountain Coal fields and into the Dakotas ... and a huge hotel "to match" in Brandon. And the Winnipeg Sun revealed that the Great North West Central destined for Prince Albert and eventually the Pacific Coast, was well under way. It would give Brandon a connection with the Manitoba and Northwestern at Rapid City and pour the shipping and trade of the entire northwest directly into the hands of the local businessmen. The Morris-Brandon branch of the Northern Pacific and Manitoba railway had been almost completely surveyed and construction was to begin immediately. "With these roads Brandon will enjoy railway facilities of a very desirable nature and will certainly realize her ambition of becoming the commercial centre of the Northwest" added the Winnipeg Sun. Daily stage coach service to Plum Creek (Souris) and Turtle Mountain augmented the excellent transportation facilities provided by the C.P.R. The depot in Brandon was Torrence's livery stable. The fact that the Federal Government had in 1887 chosen a site just northwest of the city for an agricultural experimental station not only supported the claims about the fertility of the soil but it also shed an aura of permanence and solidarity over the founding of the city. It was under the advice of a Dr. Saunders of Ottawa that this decision was made and it must have indeed been extremely gratifying to be endowed with this blessing and attention from Ottawa. The city boasted an impressive array of business institutions. One of the most important assets to a city - especially a railroad centre - is good hotel accommodation. Brandon beamed with pride every time she ushered guests into the Grand View Hotel. The "handsome" three storey brick structure, with over thirty bedrooms "large, bright and airy" had in 1882 undergone extensive renovations. New improvements were introduced such as connected sample rooms, electric bells and baths, and every room was completely refurnished. It featured first class cuisine "with the choicest and best that the season affords." It stood in a beautiful position facing the Assiniboine River and almost right in the centre of the business section. The proprietor, Mr. F. A. Boisseau reported a brisk business. (This hotel, renamed the Crystal Hotel, still stands at 838 Pacific Avenue today). The Langham Hotel was doing well under new management and the Central was the best $1.00 house in town. Of the 100 stores and businesses in Brandon at the time the most significant included a dry goods firm owned by Messrs. Sommerville and Company located opposite the Queen's Hotel on Rosser Avenue (listed in Henderson's 1932 Directory to be at 1417 Rosser Ave.) which carried $25,000 worth of stock and enjoyed a daily turnover of $200; another such firm owned by Fraser brothers - "old pioneers" - who conducted a "mammoth" business in the Masnice Block; a boot and shoe dealership featuring supermarket type display and custom shoebuilding service owned by Plumerfelt and Powers; another firm dealing in footwear and dry goods was Paisley, Miller and Calscaden whose two stores were situated on the corner of Rosser and 9th; a wholesale grocery firm located on 9th Street between Pacific and Rosser owned by Smith and Burton; a wholesale and retail business in windows, doors, blinds, mouldings, turned work and window glass owned by J. A. Moore whose business was born at the same time as the city; the Brandon Planing Mills owned by Fabes and Stirrett; a lumber yard owned by P. L. Mitchell; a photographer identified only as "Irwin" who claimed to do work superior to any in the province; a number of agricultural implement agencies, horse and cattle trading agencies (over one thousand horses had been brought in and sold in the past season mostly of the Montana and Broncho breed), the most leading of which was owned by W. George Evans who occupied the barn formerly known as Fred Torrence's veterinary surgery on 11th Street opposite the Langham Hotel; finally, an insurance agency owned by Messrs. Bucke and Pare who represented a number of fire insurance companies as well as the Canada Permanent Loan and Saving Company. They were also agents for the Dominion Express and C.P.R. Telegraph Companies. These were all known for their "push, energy, and business ability" which was probably quite true taking into consideration the fact that they had shrewdly chosen a very promising area to launch their businesses and were already - by and large - well established. Mr. A. M. Peterson's law office was located on Rosser Avenue between 11th and 12th Street. Mr. N. J. Hall was a successful druggist of "lengthy experience" who made a specialty of physicians' prescriptions and who carried a stock of pure medicine and chemicals in his quarter in the Medical Hall. Mr. Fred Torrence was the district's official veterinarian who still had his office in the barn where Mr. Evans carried on his brisk trade in horses. Civic administration was characterized by a high degree of efficiency and foresight. The city officials who were described as "obliging" were well accommodated in the new city hall and had purchased from private citizens the First and Eighteenth Street Bridges "thus conferring a boon" on the settlers north of the Assiniboine River; provided good streets and sidewalks, a good fire department with a paid captain, engineer, stoker, teamster, capital steam fire engine that had appliances for a hook and ladder company, efficient police force and good school property. In spite of all these amenities the taxes were "not too high." The reason the city took steps to acquire the bridges was that the settlers north of the river complained about the tolls (single human or animal - two cents, horseback riders or single horse vehicles - ten cents, teams - 20 cents) they had to pay. However, enthusiasm over the ownership of an 18th Street bridge died down over the years. When the provincial government recently resolved to assess the city for part of the cost of the new 18th Street bridge it was met with vigorous (but futile) opposition. Because Brandon was the county seat the Assize Court was held there and a splendid courthouse and gaol had been constructed at a cost of $80,000. The public school system had an average of some 400 scholars. "A good staff of teachers are employed and branches of the convent school under an excellent staff of teachers teach all branches of education and have about 100 pupils from the city and provinces under their charge" wrote the editor of the Winnipeg Sun. There were commodious places of worship built by the different denominational creeds and all were well attended. Benevolent societies consisted of Masons, Oddfellows, Forresters and others who had comfortable lodgerooms and met regularly. 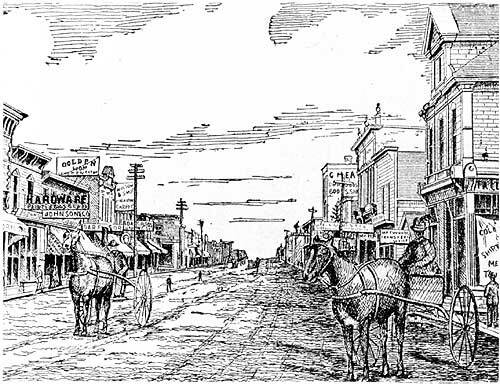 "The Brandonites are a jolly, good-natured lot of people and all seem to take a pride in their pretty, prosperous and thriving little city" added the Winnipeg Sun. "Interesting scenes can often be witnessed on the street but it's in the totals and results that the greatest satisfaction is had." An interesting discrepancy is created in the fact that while the city was aspiring to become the "commercial metropolis of Manitoba" it had done little or nothing lately to attract and secure the "incoming settler." "We understand they are about to take this matter up in a systematic manner and show the world the peculiar advantage of this locality. We do not doubt that persistent and intelligent effort in that direction will be amply rewarded." This comment by the editor of the Winnipeg Sun is especially interesting when it is recalled that fairly recently the Brandon Chamber of Commerce descended upon the city of Winnipeg with the resolute aim of '"snaring the lion in his own den." The lion was prospective business ventures that were tentatively but not finally planned for location in Winnipeg. Marshalling the massive amount of tantalizing "bait" that was not unlike the description of advantages quoted from the Winnipeg Sun, it appeared that the Chamber was mildly successful. But that first impression of how successful they were was slightly misleading judging by a recent report on the planned expansion of Brandon in the Brandon Sun of July 21, 1971. Prepared by Prof. Andrew L. Dulmage, president of Brandon University and known as Bill 107 in the Manitoba Legislature, it was given first reading on July 18, 1971 and was approved at 4:10 A.M. July 21. It was favorably received by the Brandon Sun, and the citizens of Brandon. It will extend the present boundaries of the city one mile to the north, one mile to the south and five miles to the east and the result will be a city enlarged from ten square miles to 25 square miles. Electoral ward boundaries will be altered and the Brandon industrial commission will be eliminated and a new Brandon district industrial and commercial commission will be established. The latter proposal has euphoric overtones because not only would it take in the new Brandon district planning area but it would also include the towns of Rivers and Souris and the village of Wawanesa and six neighboring municipalities. (Interestingly, all of these municipalities were included in the short-lived County of Brandon in 1883). If the annexation of these centres into the proposed new Brandon district industrial and commercial commission implies that a giant city shall someday sprawl over this vast area then surely the aspirations of the city fathers of 1888 - to make Brandon the industrial metropolis of Manitoba - have been inadvertently revived and the "lion" shall have at last made its den about 120 miles further west.